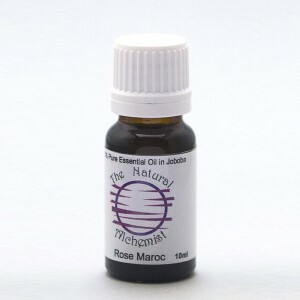 Rose Maroc – Rosa centifolia 3% in Organic Jojoba oil. A pale yellow liquid with a deep, sweet, rosy-floral, tenacious odour, see more info. Blends with: Palmarosa, chamomile, bergamot, jasmine, orange, geranium, lavender, clary sage, sandalwood, patchouli, clove bud. Uses: Topical application, massage, bath, compress, skin care, diffuser, oil vaporiser or oil burner. Emotionally calming to the mind. Used in: soap, cosmetics, toiletries, perfumes of all types, skin care, skin creams and skin conditioners. Safety Data: non-toxic, non-irritant non- sensitising. External use only, do not swallow.